A volume of edgy essays and stories by the Emmy-winning comedian and Ben Stiller Show writer includes his observations on the ridiculous aspects of life and his occasionally trumped-up memories of offbeat experiences. Read by the author. Simultaneous.
."..me again. I'm sorry, but there's something about David's wit and hilarious self-revelation that makes me want to jacket-blurb all over this thing. David's writing in this 'audio-book for the eyes' is every bit as funny, honest, and observant as the man himself-and, oddly, twice as smart. It's surprising and funny dot dot dot a triumph! Oh, and David that 'dot dot dot' shouldn't be spelled out as words. It's just meant to imply I said a lot of other stuff too. Oh and obviously what I'm saying right now also isn't part of the blurb." "David Cross is the Bruce Banner of our time, and this book is his big green monster. His energy is so intoxicating and uplifting that in some cultures his discarded bodily fluids are sold on the black market as an Irish coffee substitute. This is a great book." "A few more books like this one, and we may have to get David to pull a Sen. Al Franken." 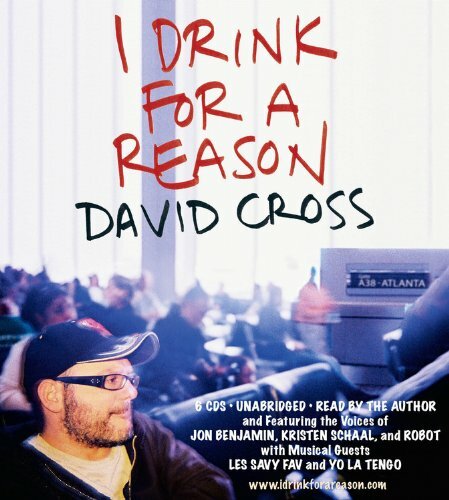 "It is inappropriate for me to write a 'blurb' for Mr. David Cross, as he is rightly a legend--utterly fearless, absolutely brilliant, and a longtime inspiration to me. My endorsement would be like the weed endorsing the sun, which is to say: I live in the dirt and require David Cross (plus water) to live. But I can grow right through sidewalks, so that's something." "Absurdist naysaying deepened by occasional blurts of actual emotion." "This book is a literary 'Development' from David that I found truly 'Arresting'. I 'dev'oured every word and had to take 'a rest' after reading as I realized this book was 'ment' [sic] to be a comedy classic. This 'Arresting' comedian has 'Developed' into an amazing and insightful writer." "A relentlessly funny insight into what makes David Cross honest and brutal, but above all, hilarious...pant-wettingly brilliant." "One of the funniest books I've ever skimmed!" "David has composed a fascinating list of the most obscure names in Atlanta baseball history, and filled the spaces between with some stuff. I don't always agree with him, but he always makes me think and smile and, unlike our conversations, in this book I actually can get a word in edgewise." ..".me again. I'm sorry, but there's something about David's wit and hilarious self-revelation that makes me want to jacket-blurb all over this thing. David's writing in this 'audio-book for the eyes' is every bit as funny, honest, and observant as the man himself-and, oddly, twice as smart. It's surprising and funny dot dot dot a triumph! Oh, and David that 'dot dot dot' shouldn't be spelled out as words. It's just meant to imply I said a lot of other stuff too. Oh and obviously what I'm saying right now also isn't part of the blurb." David Cross was born in Atlanta, Georgia, the son of Susi, a computer retailer. Six months later, they moved to New York and then Connecticut before settling back in Atlanta, where Cross remained for nearly a decade. He attended Northside High School of the Performing Arts (now North Atlanta High School), from which he graduated in 1982. He began performing stand-up comedy at age 17.